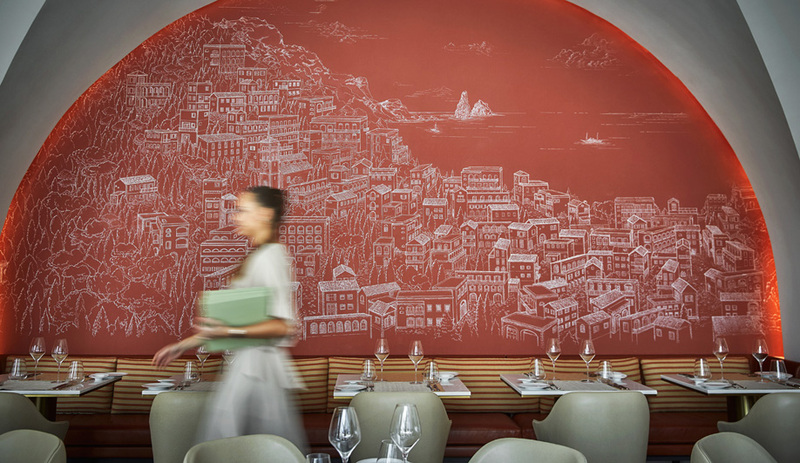 At the southern tip of Miami Beach, Oppenheim Architecture designed Forte dei Marmi, a fine-dining establishment inspired by the food and architecture of northern Tuscany. For his latest venture in Florida, star chef Antonio Mellino wanted to try something different. Located in Miami Beach – a district best-known for, as Vogue put it, hotel restaurants, Pitbull and the omnipresent oontz-oontz blaring from car speakers – Forte dei Marmi is an attempt to transport diners to Italy’s balmy Amalfi Coast. To achieve this feat, Mellino leaned on two things: his cuisine, quite naturally, and local design firm Oppenheim Architecture. The food speaks for itself. For his first North American restaurant, Mellino, who boasts two Michelin stars, developed a coastal Italian menu reliant on simple flavours, quality ingredients and locally sourced seafood. But his spaghetti alla chitarra wouldn’t be complete without the ambiance that firm principal Chad Oppenheim (and his team of Kevin Heidorn, Carla Lores, Olivier Montfort) carved from the Mediterranean Revival building. Located in the affluent South of Fifth, a peninsular neighbourhood surrounded on three sides by ocean, the two-storey eatery was imagined as an Italian villa. Translated, forte dei marmi means fortress of marble, and that’s a concept Oppenheim, 2017’s winner of the Cooper Hewitt National Design Awards for interior design, took seriously. 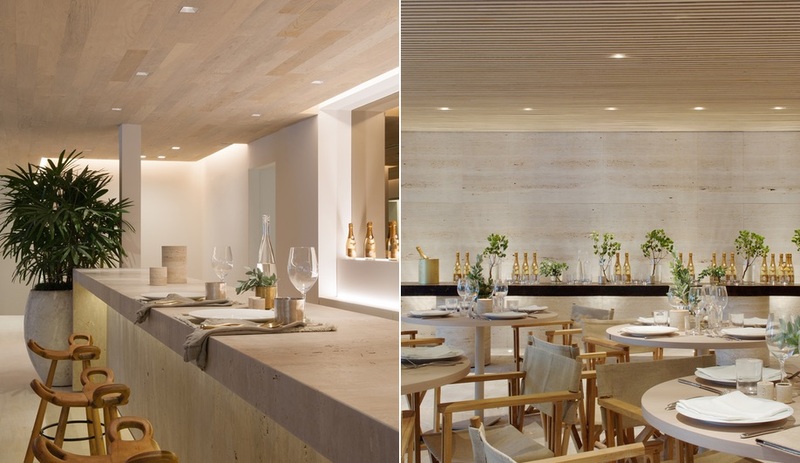 The firm used a muted material palette of wooden ceilings, stone surfacing and glass throughout, but the choice of matte Carrara is perhaps the restaurant’s defining feature. 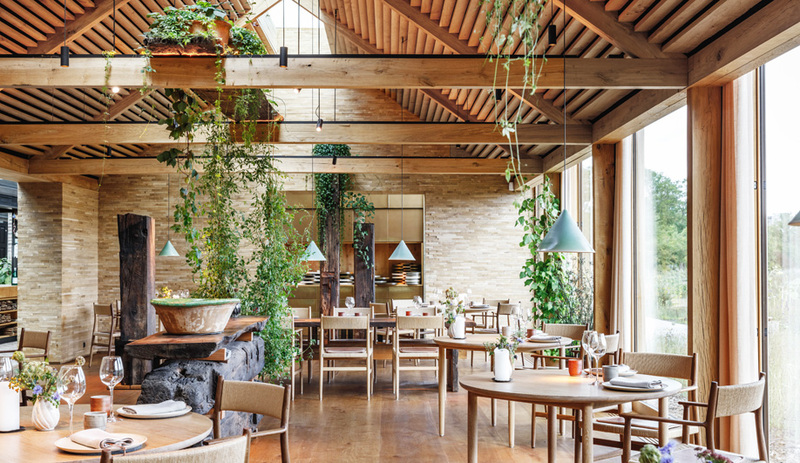 Used on its floors, walls and tabletops, it provides a simple elegance that offers “the perfect setting for enjoying the restaurant’s highly crafted culinary offerings,” the firm says. 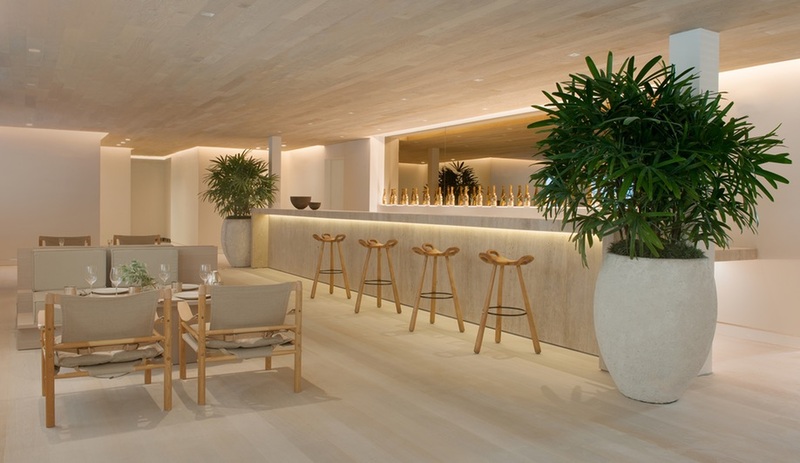 Diners enter Forte dei Marmi through its first floor, which accommodates 130 diners. Like Tuscan coastal villas, the breezy outdoor space is critical here: the entry bisects an open-air lounge, while three separate terraces surround the indoor dining space; there are 22 outdoor tables, along with an eight-person communal table. The custom furniture, both indoors and outdoors, was made by Henritimi, which also provided the space’s millwork and flooring. 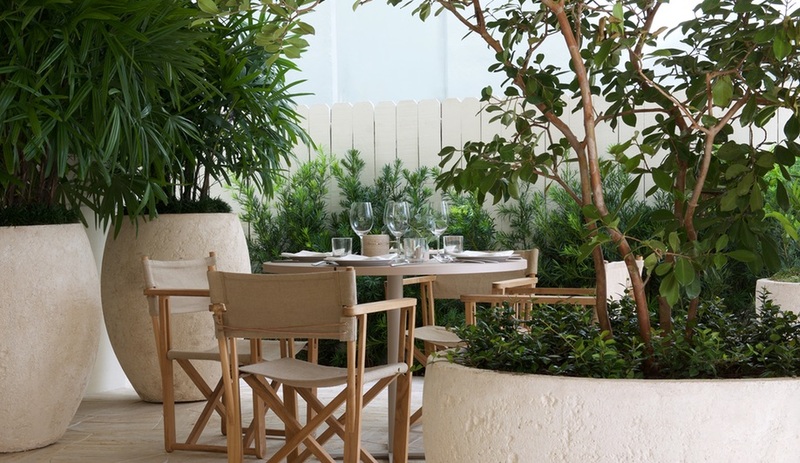 Sculptural concrete planters (above) also add greenery to Forte dei Marmi’s neutral palette. After entering through the building’s original arched doorways, the dining room is defined by a narrow antipasti bar, studded with tea lights, imported olive oils and a range of edibles. 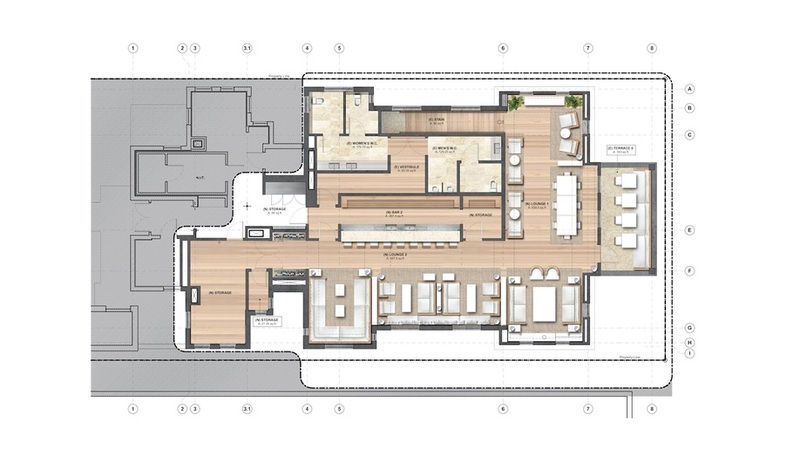 It’s flanked by a concealed service area, wine cellar and bathrooms. A set of stairs leads visitors upstairs, where the restaurant transforms into a different experience – and one that’s much more intimate. 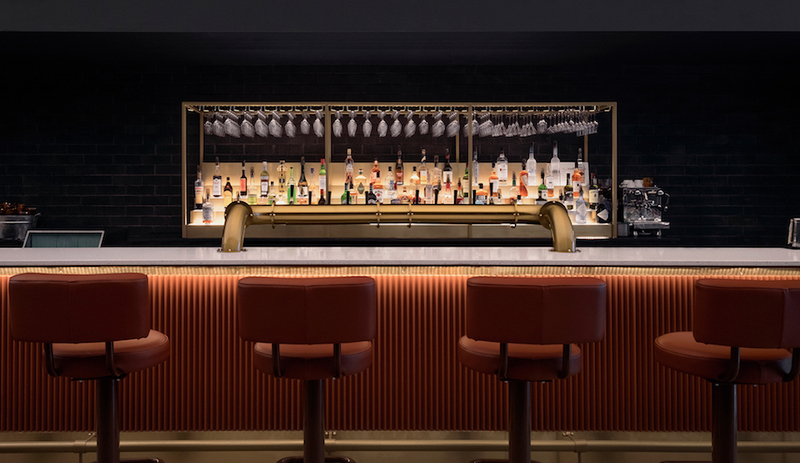 Forte dei Marmi’s 62-seat second storey is a lounge, bar and cultural venue – and one that’s meant to further elevate the dining experience. 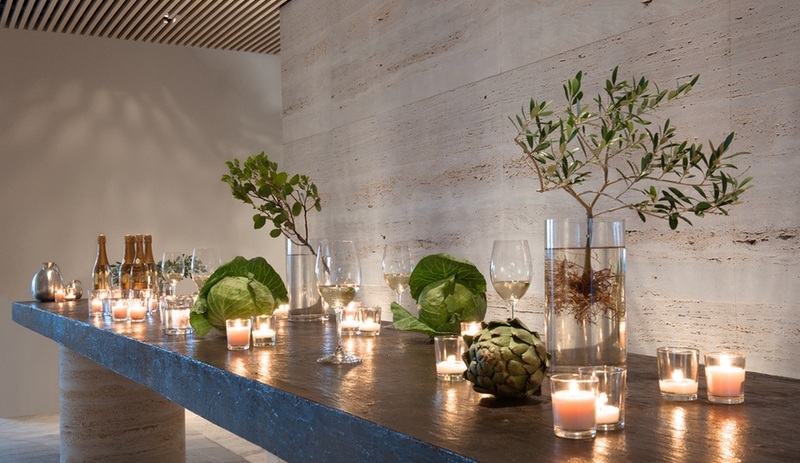 Oppenheimer sought to “create an intimate, finely furnished environment that promotes unique sensory dining.” And the firm largely succeeded: it’s now home to the FDM Arts Club, which has paired an “epicurean experience” with performances by jazz singer Elizabeth Zito and a screening of the SuperDesign documentary. Four private booths and a terrace orbit two interlocking lounges. 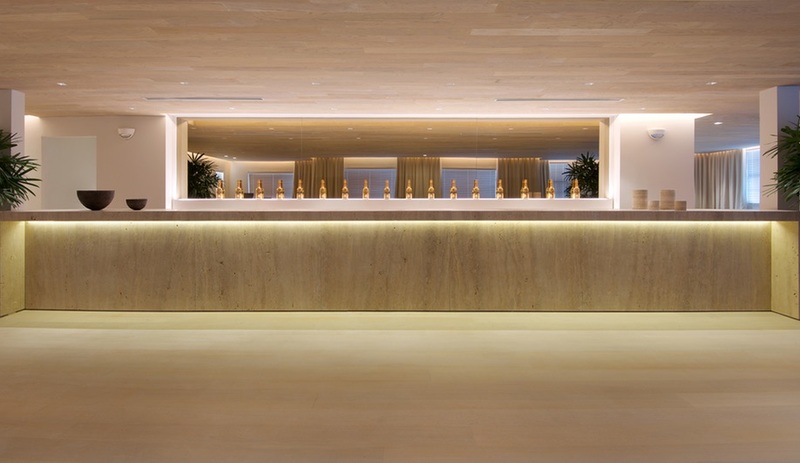 The focal point, here, is a stately bar, custom-made by Henritimi. 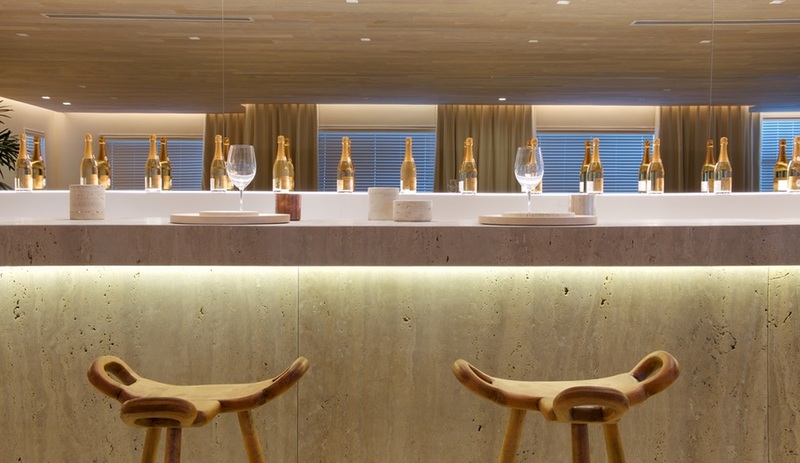 True to the restaurant’s ethos, the bar is understated, lit by undermounted LED strips. 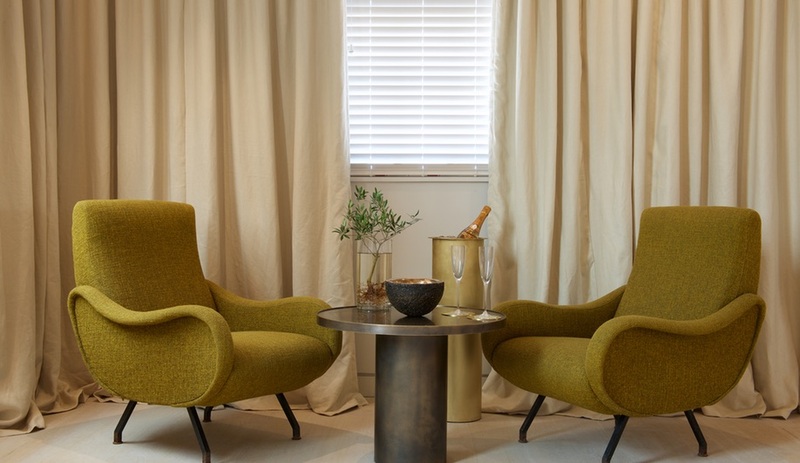 It invites guests to ponder two things: the quality of its Carrara-marble construction and the glass of wine they’re sipping. Chef Mellino, we suspect, wouldn’t have it any other way. 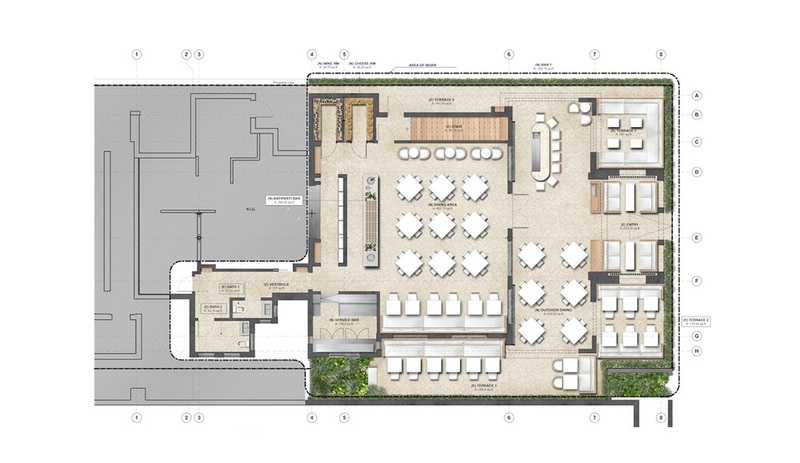 Below, the floor plan of Forte dei Marmi’s second-storey lounge.